Did you know that some towns actually shut down in the afternoon so that everyone can go or a quick power nap, recharge and come back to work? Unfortunately, this isn’t the case in the US where a mid-day nap is quite the luxury rarely who can afford and is often considered a sign of utmost laziness. If you’re among those who enjoy the occasional weekend snooze, feel free to continue with it because as it turns out napping is healthy and it’s a normal and integral part of the circadian (sleep-wake cycle) rhythm. You’ve probably noticed that as you go about your day and time passes by, your focus and alertness start degrading, even if you’ve had a decent night sleep. And even if it’s not a big deal nowadays, back in the day it may have been a life or death question. So whether you’re working hard on a project or just doing your job to provide for your family, a short nap can really power you up and keep you going for much longer. You don’t need much; just 15 to 20 minutes can make a world of difference. And the funny thing is that world renowned companies who pay top dollar recognize this need, Apple and Google are just a few of the companies which let their employees to take a short nap after lunchtime. Even studies have shown that short naps can improve awareness and productivity. According to a study from the University of Colorado Boulder discovered that children who didn’t take their afternoon nap didn’t display much joy and interest, had a higher level of anxiety, and lower problem solving skills compared to other children who napped regularly. The same goes for adults as well. Researchers with Berkeley found that adults who regularly take advantage of an afternoon nap have a better learning ability and improved memory function. 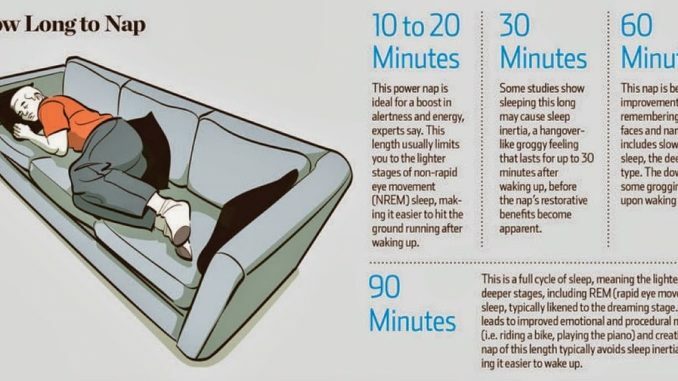 Why is napping so essential? Because it gives your brain a reboot, where the short term memory is cleared out and our brain becomes refreshed with new defragged space. According to experts, 10 to 20 minutes is quite enough to refresh your mind and increase your energy and alertness. The sleep isn’t as deep as longer naps and you’re able to get right back at your day immediately after waking up. If you nap for 30 minutes you may deal with a 30 minute grogginess period because you wake up just as your body started entering a deeper stage of sleep. The same can be said if you sleep for an hour, but on the other hand, these 60 minute naps provide an excellent memory boost. The longest naps— lasting about 90 minutes—are recommended for those people who just don’t get enough sleep at night. Since it’s a complete sleep cycle, it can improve emotional memory and creativity. There you have it – naps are good for you physical and mental well-being so you should practice them as much as you can. However, be advised that you shouldn’t sacrifice night time sleeping for an afternoon nap, they should be an addition to a good night sleep.